-We'll be testing the Republican gubernatorial candidate field both with and without Charlotte mayor Pat McCrory. It'll be interesting to see how much support is out there for him, and which of the three current contenders would be most affected by his entering the race. -We'll be adding former Arkansas governor Mike Huckabee to the Republican presidential question. -We'll be adding the Republican Lieutenant Governor primary to the poll, pitting state senator Robert Pittenger and former congressional candidate Greg Dority. Stay tuned for those results next week! UPDATE: It took Perdue about an hour to attack right back. Sigh. Last night Bev Perdue made a proposal for budget reform. Today Richard Moore met with reporters to attack her for it. That's been pretty much par for the course any time either of them has put a policy idea forward. Here is my dream. We have two very capable Democrats running for Governor who have both done a great job serving the state of North Carolina. Either would be a fine executive. Maybe, just maybe, sometime during this campaign one of them could announce a policy initiative and when the other was asked to comment they could say it sounded like a fine idea and they didn't have a bad thing to say about it. Candidates can draw contrasts between themselves and their opponents without attacking every proposal they make and every little thing about them. My vote will probably go to the candidate whose campaign best seems to end up grasping that message. -In the Democratic gubernatorial primary Bev Perdue leads Richard Moore 31-25. Proportion wise that's about where we've been- Civitas has more undecided respondents because they poll general election voters. -In the Republican primary, Bill Graham leads with 19% followed by Fred Smith with 14% and Bob Orr with 11%. They hadn't polled the Republicans since September when there was basically a three way tie. Our poll this month showed Smith vaulting Graham after Graham had led the rest of the year. It'll be interesting to see what we get next week. -Civitas also enters the Lieutenant Governor fray, presumably in response to Republican senator Robert Pittenger's recent moves toward entering the race. They matched Pittenger up with fellow senator Walter Dalton, assuming I guess he would emerge from the Democratic pack. Dalton led 19-17. They also did favorable/unfavorable ratings for the two. Dalton is 4% favorable, 2% unfavorable while Pittenger is 4% favorable, 3% unfavorable. Not much to take from that. -They included Mike Huckabee in the question on the Republican presidential race and he finished tied for second. That's good enough for us. He'll be in the next PPP tracking poll. Rudy Giuliani continues to lead while Fred Thompson's free fall continues. He went from 25% in September to 19% in October and now 12% this month. -On the Democratic side all three of the main contenders saw their support drop from the October poll, while the number of folks unsure saw a significant increase. The opposite trend is supposed to occur as the election gets closer so I'm not sure what's happening there. Hillary Clinton maintains a solid lead. -They asked some match up questions for the presidential race in North Carolina. Giuliani leads Clinton 45-41, Mitt Romney leads Clinton 43-42, and Clinton leads Thompson 43-42. What's interesting about that is they asked respondents which of the Democratic contenders was most electable. Nearly half said Clinton- but when asked the head to head question she didn't fare all that well. I wonder if Barack Obama or John Edwards would have done better, which would have shown that while respondents think Clinton is more electable in general she is not more electable to them. -US Senate matchups showed Elizabeth Dole with a 46-29 lead over Kay Hagan and a 47-27 lead over Jim Neal. Earlier this month transfer tax referendums were defeated in 16 counties across North Carolina. Some on the right and in the development community have declared that result to be the death of the concept of having those responsible for the rapid growth in many counties across the state pay for their fair share of it. I thought the failure of the referendums was more the result of mismanaged campaigns and a lack of a coherent and compelling message. A recent poll my firm Public Policy Polling conducted of likely Wake County voters shows that the transfer tax is a popular concept, if people have a proper understanding of the alternatives. The most important message to convey to the voters is that there are costs associated with growth and that they will have to be paid through some form of taxation. Foes of transfer tax measures this fall created the impression that not paying was an option. It isn’t, and the counties with referendums this fall failed to get that message across to their citizens. In order to leap that hurdle we prefaced our poll with the statement that ‘Wake County is growing rapidly and must increase its revenue to pay for new schools, parks, roads, water and sewer.’ Given that background and before being asked about alternative ways of paying for growth, poll respondents supported a transfer tax by a margin of 49-40%. Support for the transfer tax increased when folks were given the choice of a transfer tax or another form of taxation. For instance when pitted against the specter of property tax increases, a transfer tax was preferred by a spread of 59-20% among survey respondents. If counties effectively communicate that a transfer tax will help relieve the burden of property tax increases, their voters are much more likely to support a referendum. Counties have also been given the option of increasing the sales tax to generate new revenue. That is not a popular concept in Wake County. Only 34% of those polled supported a quarter percent increase in the sales tax to pay for growth, and when the options of a sales tax increase or a transfer tax were pitted against each other, the transfer tax was preferred by a margin of 54-31%. Recently several Council members in Raleigh and Cary were defeated by responsible growth opponents after their ties to the realtor and developer community were made widely known to the public. The pro-growth lobby is not politically popular and our poll shows that if voters are aware that they are the ones largely funding the opposition to the transfer tax it becomes a more popular issue. 45% of respondents said knowing that the anti-transfer tax campaigns are largely funded by the realtor and developer lobby made them more likely to support the transfer tax, while 29% said they didn’t know if it would impact their vote. Only 25% said that knowledge would make them less inclined to support it. Just as getting the word out about who was behind the campaigns of Jessie Taliaferro, Tommy Craven, and Ernie McAllister helped the campaigns of Rodger Koopman, Nancy McFarlane, and Harold Weinbrecht, making sure voters are informed that it is growth interests fueling the opposition to the transfer tax will earn it greater popularity. What’s the bottom line? The transfer tax was doomed only by ineffective campaigning and message delivery. Since public money rightfully can’t be spent by counties to support their transfer tax campaigns, committees of prominent community leaders and citizens need to be formed to raise money and build support for the referendums. Most importantly, they need to thoroughly educate voters on what the options are to pay for the costs of growth while making it crystal clear that not paying is not an option. Only if voters thoroughly understand that the failure to pass a transfer tax will mean higher property tax increases for years to come, will it succeed. The 16 defeats represent a failure in leadership by our elected officials and the progressive community. Let’s hope we learn from it. According to our latest survey released today, likely voters in Wake County support a transfer tax on property sales by a margin of 49-40%. When presented with other options of paying for growth such as sales tax and property tax increases, more than half of the respondents favored a transfer tax. Below are excerpted results. Click here for the press release and complete results. In order to pay for the costs of growth, would you support or oppose a tax of less than a half percent paid when a house or property is sold, called a transfer tax? Another way to pay for the cost of growth is to raise property taxes every year. Would you prefer to pay for these new roads and schools by increasing property taxes or by a transfer tax on property sales? Another way being proposed to pay for growth is a quarter percent increase in the sales tax. Would you support an increase in the sales tax? We can pay the cost of growth by a small transfer tax paid when real property is sold or by a small increase in our sales tax. Which do you prefer? If you knew that opposition to the transfer tax was being almost exclusively funded by the realtor and developer lobby, would you be more or less likely to support a transfer tax? Earlier this month I wrote about how nothing was going on in the Lieutenant Governor's race. 1) It separated Dellinger from the pack he's often been lumped in with candidates Dan Besse and Pat Smathers. There seems to be a segment of Democratic leaders in the state that supports Dalton. There seems to be another segment that is anti-Dalton but likes Dellinger, Smathers, and Besse and doesn't know who to support of the three. By criticizing Dalton's voting record and using it as an opportunity to push his own progressive views, Dellinger has moved himself out of the pack a little bit. If this race gets to a runoff I think Walter Dalton loses- he needs to sneak by with 41% of the vote in the primary. And it will probably take one of the other three candidates becoming a 'co-front runner' with Dalton to force that runoff. Dellinger was already primed for that spot because of his fundraising prowess, but his move this week does more to get him in the public eye on that front. 2) Dellinger stuck to the issues. I have been very critical of Bev Perdue and Richard Moore for the pettiness that pervades their race. But Dellinger didn't talk about minute details of Dalton's educational background or get an out of state family member to file a public records request. He went straight at specific items in Dalton's voting record. I think that's perfectly fair game. 3) He put Dalton on the defensive and Dalton's response was weak. He sent out an e-mail spouting platitudes about his record; where Dellinger offered specific critiques Dalton gave vague responses. He also claimed Dellinger's attack was the 'worst aspect of the campaign season.' I don't think anyone really buys that criticizing an opponent's public voting record is one of the lower things that occurs in a political campaign. We're doing our tracking poll next week- it will be interesting to see if this incident causes any movement in the numbers. I doubt it will, but there's little doubt that Dellinger's move this week has caught attention with opinion leaders. Besse and Smathers will need to do something of this magnitude to bring the same level of attention to their campaigns and Dalton's going to need to find a better way of responding to attacks. Every four years there seems to be a controversy over who does and does not get invited to participate in the presidential debates. The general rule of thumb seems to end up being that folks get to participate if they're running at over 5% in the polls. But how do you decide who gets to be in the polls? That's question I'm wrestling with this week. It's hard to take either of these guys very seriously. But we included another fringe candidate, Democrat John Ross Hendrix in our Senate poll earlier this month. He was the choice of 8% of the respondents. By means of comparison John McCain had 8% and Bob Orr had 7% in our presidential and gubernatorial polls, and we wouldn't consider dropping them from our polls. We're doing our poll next week and I really don't know whether to add Powers and Nielsen or not. If you have an opinion leave a comment or feel free to send me an email. Over at the Dome blog, Ryan comments that several Democrats have said Bob Orr is the more reasonable of the Republican contenders for Governor. Beyond Wayne Goodwin and Jim Protzman who he cites, I've heard this from a lot of other people as well. As far as I know there have not been any public head to head polls on potential general election match ups in the Governor's race. That makes it hard to know if the respect of Orr crossing party lines is a broad trend or just an anomaly among some of the state's opinion leaders. And as Goodwin and Protzman have said even if Orr got the Republican nomination they'd vote for the Democratic candidate. One thing that the recent SurveyUSA poll can tell us is that Orr won't get far on the support of self identified moderate and liberal Republicans in the primary. Although he polled slightly better with those groups than he did among conservative Republicans, conservatives made a up a whooping 64% of the sample. It will likely be the candidate who can best appeal to that demographic who will come up with the GOP nomination. The respect Orr gets across party lines shows that many people think he's a good guy. But it probably won't do much to move him closer to the Governor's mansion. It's been a slow week on the North Carolina polling front but in the spirit of the holiday we'll break down the results of Quinnipiac's national poll on which Presidential candidate respondents would most like to have Thanksgiving dinner with. Hillary Clinton leads the way for the Democrats with 27% of the vote. Assuming Bill would be coming along for the ride that's quite understandable- possibly two presidents for the price of one. Barack Obama finishes second with 24% of the vote, but interestingly is the top choice of Republican respondents among the Democratic field. Clinton in facts fall to third on that crosstab with Republicans favoring John Edwards as a dinner guest as well. On the Republican side Rudy Giuliani is the top choice with John McCain and then Fred Thompson falling behind. Democratic respondents apparently are less willing to break bread with a GOP hopeful than the other way around- the top choice for them is that they wouldn't eat with a Republican candidate. Former Arkansas Governor Mike Huckabee, who finished fifth in the poll, would be my choice. Given his propensity for dieting and healthy eating I know there would be plenty of left overs! In a somewhat related story, check out this New York Times article about Presidential candidates eating on the campaign trail. Day 2 of last week's multi state (Florida, Georgia, North Carolina, South Carolina, Virginia) Elon Poll surveyed the attitudes of southern voters toward the President and Congress. Not surprisingly respondents disapproved of President Bush by a 57-34 margin. The unpopularity of President Bush is not exactly breaking news. Although 44% of respondents thought that Congress would do a better job on the main issues the nation faces compared to 32% for President Bush, not many folks surveyed think much of Congress either. Over half the respondents said that their confidence in Congress has decreased lately and only 4.1% of folks said they had a lot of confidence in Congress. Do these results mean we're going to see a lot of turnover of Congressional seats from the southern states next year? Don't count on it. I think this is a classic case of the old adage that people 'hate Congress but love their Congressman.' For the most part voters always say they think Congress is doing a bad job but they generally like their actual representative. It would have been interesting for Elon to ask a question about whether respondents approved of their Congressman's performance. I bet that number would be pretty high. If more than one or two Congressional seats in this five state area flip next year I would be surprised. Mark Binker did a lengthy story on the US Senate race and what impact the immigration issue could have on it over the weekend. The thrust of it was that it was an issue that would help Elizabeth Dole. And the recent poll we did matching up Dole and state senator Kay Hagan backs that up. Of those who said immigration was their top issue, 79% said they supported Dole and just 9% said they supported Hagan. When we polled Jim Neal vs. Hagan we didn't ask respondents what their top issue was so I don't have data for that but will try to remember to include it next time. The thing is, only 10% of the respondents to our poll said immigration was their top issue. In addition to the war in Iraq, other issues out polling immigration as a first choice were economy and jobs, moral and family values, and health care. Dole had a huge advantage among respondents concerned with taxes, moral and family values, and immigration. Hagan had a large lead from those who listed education and health care as their top issues. Where the differences in support tightened between Dole and Hagan were on the two issues that respondents said were most important- the war in Iraq and the economy and jobs. Dole had a six point lead on the former issue while Hagan had a nine point lead on the latter issue. The immigration folks are the loudest and they're probably also the most intractable- respondents stating immigration as their top issue had the lowest level of indecision about who they would support in the Senate race- but the majority of folks doing our last poll said that Iraq or the economy was their top issue. Hagan's best chance will come if she can convince the voters she's the better candidate on those bread and butter issues. In what is certainly not a scientific poll, state senator Fred Smith led the way with 63% of the 203 votes cast in a straw poll for the Republican gubernatorial primary held at the North Carolina Republican Party's GOP Hall of Fame dinner over the weekend. Bob Orr had 22% of the vote and Bill Graham finished last with 15%. The huge disparity between Smith and Graham speaks to the differences in their styles and the way they're running their campaigns. Smith is running an old style North Carolina campaign, going to barbecues and meeting with party activists in as many different counties as he can. Those are the kinds of people who will go to a GOP Hall of Fame dinner, and that retail politicking is earning their support. Graham on the other hand has poured hundreds of thousands of dollars of his own money into extensive media campaigns on the gas tax and immigration to build his visibility. He will likely run a campaign in which he largely skips over local GOP leaders and uses his funds to take the message straight to the voters. The results could say something about what the most effective type of campaign to run is in 21st century North Carolina politics. There's been criticism in several quarters of a recent North Carolina Economic Development Association poll about economic development incentives in North Carolina. I sort of agree and sort of disagree. While many of the questions clearly are written in such a biased manner that they would almost inevitably lead to the preferred response of the NCEDA some of the questions are reasonable and yield similar results to a poll we did earlier this year. One of those questions gave background information about the Caldwell County Google incentives package- what the positives would be in terms of job creation and what the monetary cost would be for the state- and then asked respondents whether they were in favor or not. The NCEDA poll showed 43% of respondents in support of the Google deal with 50% opposed. Our poll on the issue in March showed 36% in support of the deal and 46% opposed, a pretty similar outcome. Opposition to the Google deal does not mean general opposition to economic incentives though. We asked a general question on the issue of providing tax breaks and financial incentives to companies in exchange for job creation, and 58% of respondents generally supported the idea with 30% opposed. NCEDA asked a similar question on economic incentives generally and showed 61% in favor and 33% opposed. The conclusion I'd draw from those two questions on two different surveys is that North Carolinians have a generally favorable view toward incentives but are inclined to decide what is appropriate on a case by case basis. What's interesting though is that even though North Carolinians opposed the Google deal, the company actually has a very popular image with poll respondents. 75% of respondents to the NCEDA poll have a favorable attitude toward Google. -Folks may support incentives but not the Google deal even though they like Google because the company's success is well known and folks might be inclined not to think it deserves any public money. I think that's part of the equation. -The bigger part of the equation though is that I think people support incentives only in their back yard. I'm sure folks in Caldwell County are thrilled with the Google deal. But folks in Camden County aren't happy to pay for it. Folks in Cumberland County were glad at the investment in Goodyear, but the people in Macon County don't see any benefit to their tax dollars paying for that. I think it would be hard for any individual incentives deal to draw a majority of statewide support, but folks will always be happy to support something that benefits them locally. There's been a mini controversy brewing today about polling, state employees, and the ceaseless Perdue/Moore bloodbath. SEANC (the State Employees Association of North Carolina) recently commissioned a poll that showed 47% of responding members supporting Bev Perdue for Governor, with 32% supporting Richard Moore. The poll was conducted by Hart Research Association, which also happens to be Perdue's pollster. My understanding is that Peter Hart himself works with SEANC while his partner Fred Yang works with Perdue, as he also worked with Mike Easley. Some folks think that's a problem and some people don't, according to a Charlotte Observer article today. Meanwhile Richard Moore's campaign released results from a poll it did showing Perdue with only a 32-30 lead over Moore among respondents who worked for state government or were state retirees. -On the conflict of interest issue, it's really up to the members of SEANC and the Perdue campaign to decide if there's a problem or not. If both entities are comfortable with it, it doesn't seem like an issue. -In the absence of more specifics the numbers Moore's camp put out today are meaningless. If their poll surveyed 800 people I would guess fewer than 100 were current or retired state employees and with a sample of that size the results would have little significance. It would be good for the Moore campaign to release more specifics if they want to make the case that the SEANC numbers were overly friendly to Perdue. 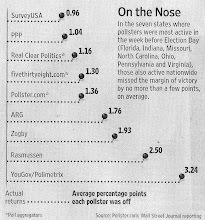 The Elon poll is not nice to John Edwards. The southeast (Virginia, North Carolina, South Carolina, Georgia, Florida) regional poll released today shows Edwards with the support of only 11% of self identified Democratic voters. That is actually up from a similar February Elon poll that showed him with the support of less than eight percent. One thing the February poll did that today's poll does not is break out the results by the state of the respondent. Then, Edwards had the support of 13.5% of North Carolina respondents. PPP and Civitas both did North Carolina presidential polls that month and showed Edwards with 34% and 24% levels of support respectively. Elon released a new poll today showing presidential preferences in Florida, Georgia, North Carolina, South Carolina, and Virginia. I don't know how meaningful these multi-state polls are since the individual samples for each state end up being pretty small and we of course do not elect the President by a popular vote but there are still some interesting trends. In the generic presidential ballot more respondents said they were inclined to vote for a Democrat next year than a Republican by a margin of 36.2-34.6. At first glance this would seem like pretty bad news for Republicans since they won every one of these states in 2004. But Elon did a similar poll of southern states in February and at that time the generic presidential ballot gave Democrats a 42-31.4 margin. With the luster of the new Congress wearing off and many Americans seemingly as disgusted as ever with Democrats in charge, that spread has tightened in the last eight plus months. That said, if Democrats really do end up with a popular vote majority in this set of states it seems a safe bet there will be a Democrat in the White House in 2009! Chris Cillezza of the Washington Post blogs that Fred Thompson is foundering in the polls. He cites national polls and some state ones. In North Carolina, Thompson is definitely headed in a downward direction. Thompson's support in North Carolina has fallen in nearly every month. Now he leads Giuliani by only 5%. According to Survey USA he is already losing to Rudy in the Tarheel State. Thompson's national poll numbers have always been buoyed by a strong showing in the southeast. If his southern supports dips then he won't be able to stay in second in the national polls. One of the most striking results of last week's Survey USA poll on North Carolina was a 30 point gender gap between Bev Perdue and Richard Moore. Perdue led by 23 points among women, while Moore led by 7 with male voters. Our monthly tracking polls this year have tended to show some level of gender gap between the candidates but never one this large. The largest gap our surveys have shown is 19 points in August. In April and June Moore even polled better with women than he did with men. The average gender gap of our 11 monthly polls this year shows Perdue faring nine points better with female voters than males. That seems about right. Over at Talking About Politics yesterday, Carter Wrenn referred to possible spending recommendations by the Special Transit Advisory Commission as a 'boondoggle' and suggested that paying for it wouldn't be particularly popular with voters. At the Under the Dome blog, Gerry Cohen pointed out that just last week in Mecklenburg County 70% of the voters chose to continue a special tax used just for mass transit. What level of support is there for transit in the Triangle? Last April PPP did a poll that gives some clues to the answer of that question. In it, 51% of respondents said that congestion was a major problem and 69% saw it becoming a much worse problem in the next five to ten years. When asked whether the solution to the problem was just to build more roads or to develop a broader set of public transportation options besides roads, 70% of respondents expressed support for developing a variety of options. We'll probably ask a question in an upcoming poll about whether local voters would be willing to approve a tax similar to the Mecklenburg one for transit projects in the Triangle. The SurveyUSA poll done last week for the Democratic Senate primary seemed to flip the conventional wisdom about where Kay Hagan and Jim Neal will draw their support from on its head. Kay Hagan has been painted as the establishment candidate, presumably drawing more of her support from the conservative and moderate sides of the Democratic Party while Neal has been portrayed as the darling of progressive bloggers. Yet last week's poll shows self identified liberals supporting Hagan 41-35 while those describing themselves as conservative gave their support to Neal by a 34-31 margin. My guess would be that with the candidates not very well known yet, liberal respondents were more supportive of a woman. I have a friend with an interest in the Lieutenant Governor's race who calls me frequently and asks when I think we'll start to see some movement. When we started polling the Democratic Lieutenant Governor primary in February, 59% of respondents were undecided. That first poll had the highest percentage of respondents choosing a candidate of the ones we've done all year. Since then the percentage of undecided respondents has fluctuated in the range of 62-66%. The candidates are out working hard, attending events across the state, and speaking to pretty much any crowd that will have them. But until they start spending a lot of money, probably in March and April, it's unlikely anything the candidates do will have enough resonance with voters to cause any significant changes in the polls. An interesting although risky tactic would be for one of the candidates to go on the air or start doing mail in the next couple months instead of waiting until close before the election. The downside could be a contender blowing all his money and having none left for the stretch run. But it could also allow one of the candidates to remove himself from the pack and build momentum that would ease fundraising and make it possible to recoup the funds spent earlier so as to have plenty left to spend in the last month or so when voters are really starting to pay attention and decide who to vote for. County-wide transfer tax referenda went down in flames all over the state yesterday. See some of the reaction here and here. To start, I agree with synopsis posts by Gary Pearce and Bob Geary. Bob points out that people don't like to vote for taxes, especially if its unclear what the taxes are used for. I wholeheartedly agree. If a vote for the transfer tax were directly related to more money for schools then they would have been more successful. Gary points out that better campaigns win. I agree with this as well. The county commissioners in each of the 16 counties that held transfer tax referenda did a terrible job selling it. I didn't see any evidence of organized pro-transfer tax campaigns anywhere. The anti-transfer tax people were definitely organized. So is the transfer tax option doomed to fail everywhere else? Wake County Commissioner Tony Gurley said in the N&O this morning that he is wary of putting it up for a vote next year. I don't think the transfer tax is doomed to fail. It just needs to be repackaged and sold better. First, the transfer tax is more popular if it is explicit that the money goes exclusive to education. Second, and most importantly, the transfer tax is more popular if voters understand that it is an alternative to property tax increases. County commissioners need to explain to the voters that if they don't raise the transfer tax , then property taxes will have to be raised. Someone has to pay for growth and the increasing costs of infrastructure. The transfer tax will be more successful if it is sold as a fairer way to pay for growth. The Survey USA poll released today on the Republican Presidential primary in North Carolina broke down the choices of respondents by whether they regularly, occasionally, or almost never watch Law&Order. One would assume that fans of the show would give their support to Thompson at a high rate but that is not the case. While Thompson trails Giuliani by 11 points in the poll as a whole, the deficit is 13 points among viewers who regularly watch Law&Order! The big unanswered question: are Law&Order fans less inclined to support Thompson because of his acting skills or his political skills? Thompson's highest level of support comes from occasional viewers of the show. For the first time in an entire year Survey USA has conducted a North Carolina poll. Thanks to isabeladone at BlueNC for bringing this to my attention. See complete crosstabs here. Their numbers are similar to ours in some respects but at other times are very different. Not sure why. Fred Smith is on the move! This is his second consecutive month with significant increases in support. For the first time he is now leading the Republican race for Governor. This is my last week with Public Policy Polling. I have taken a new job with the Bev Perdue for Governor Campaign. I'm excited about my new opportunity. I am going to try to stay connected with PPP and the blogging community. I will probably still post some here, but much less frequently. Taking over my duties at PPP will be Tom Jensen. Tom has been working at the NC Sierra Club running their very successful "Cool Cities" campaign. NC now has the 4th most "Cool Cities" in the nation. Tom has extensive campaign experience, working for over 20 campaigns. He is also a member of the Chapel Hill Planning Board. Tom should pick up right where I left off and he will keep this blog up-to-date. You'll keep getting great polling and analysis from PPP. The November primary tracking polls are now available, including the first poll on the Democratic senate primary between Kay Hagan and Jim Neal. Click here for complete results. Who's that talking 'bout our poll? Hagan does about as expected. Remember that last week our poll found Jim Neal trailing Elizabeth Dole 47% to 32%. Neither starts off with any advantage in polling. Senator Burr: 30% approve, 34% disapprove OUCH!